Electrical circuit wiring requires building a proper path in which the electrical current can flow. Some fundamentals of electrical circuits are common to all circuits, including high voltage neon secondary circuits. One basic fundamental is that for current to flow, there must be a source (voltage) and a circuit that is complete and connected to the source. It should be understood that current will always try to return to its source. Basically, what goes out must return to the source (transformer or power supply). 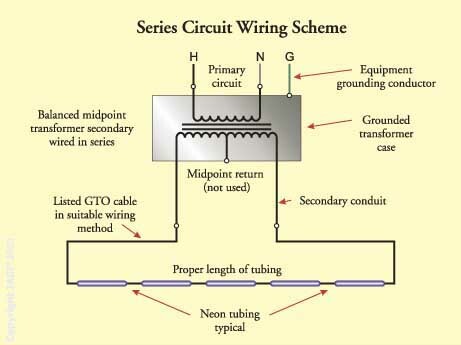 If the circuit (GTO secondary conductors) is not complete, and both supply and return circuit paths are not connected, the circuit will not work. This is a common element to all electrical circuits. Another fundamental property of electrical circuits includes the path the current will take in order to return to the source. If there is one path out from the high voltage secondary hub of a neon transformer and one path back over suitable conductors (GTO high voltage conductors) to the other hub of the source, it will be the path the current (in mA) in the circuit will take. Electrical current will always seek its source, and it will take any and all paths available to try to return to the source (see figure 1). If there are multiple paths in the circuit, the current will divide over those paths. The amount of current flowing in any particular path is directly related to the amount of impedance or opposition in that path. It is important to keep current flowing on the path it was intended. This means, in simple terms, one must build a suitable circuit that includes a supply lead and a return lead to the source. This article emphasizes high voltage neon secondary circuits and what is required for functionality and safety relative to the circuit path. In the neon industry, three basic wiring schemes are used for neon circuits and systems. They are the conventional series wiring, the midpoint return wiring method, and the virtual midpoint wiring method. All three of these methods are explained in detail in chapter six of IAEI’s book, Neon Lighting. 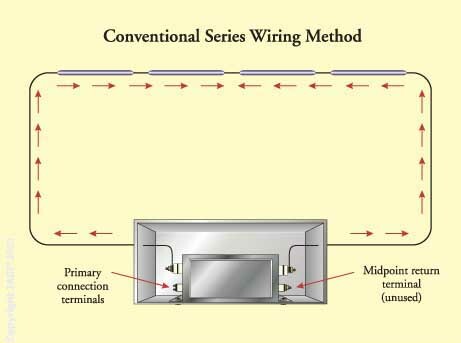 This article takes a closer look at the conventional series circuit and the midpoint return wiring method. The conventional series wiring is a simple series circuit that includes a secondary conductor from the high voltage hub of a neon transformer or power supply to the first electrode. There are usually intermediate jumper conductors between multiple sections of neon tubing in the sign or system that complete the circuit. From the electrode in the last tubing section, the secondary conductor returns to the other high voltage secondary hub on the transformer, completing the circuit (see figures 2 and 3). 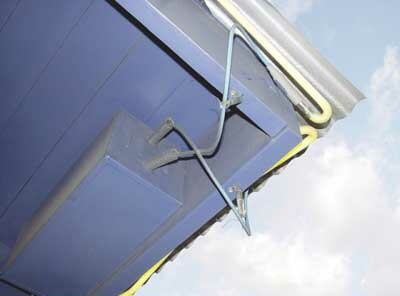 The other wiring scheme is known as the midpoint return wiring scheme. This wiring includes a secondary conductor from each high voltage secondary hub on the transformer routed out to the first tubing electrode on opposite ends of the tubing in the circuit. This wiring method also includes two secondary return conductors that are required to return to a terminal or lead on a transformer or power supply listed and identified for this type of wiring scheme as required by NEC 600.32(H). The result is four GTO secondary conductors connected to the transformer or power supply. 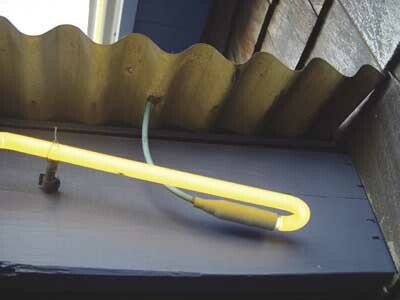 It should be noted that the Code requires neon secondary circuit conductors to be as short as practicable and not to exceed the maximum lengths of 6 m (20 ft) where installed in metallic methods, and not more than 15 m (50 ft) where installed in nonmetallic methods as specified in 600.32(J)(1) and (2). This works to minimize the stresses and capacitance effects on these high voltage secondary circuits. Figures 3 and 4 are provided to show a basic schematic of a midpoint referenced wiring scheme. Note four secondary conductors terminate at the transformer. 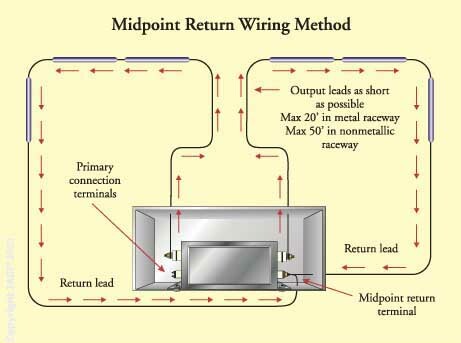 The secondary return conductors in the midpoint referenced wiring method must return to the transformer or power supply. Figure 4. A basic schematic of a midpoint referenced wiring scheme. 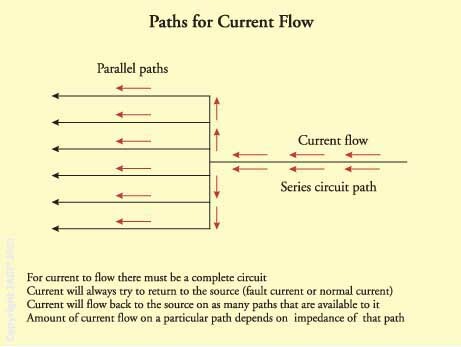 One fundamental of electrical circuits is that current can flow over any conductive paths available to it. The Code requires the secondary return conductors to terminate on the terminal for this purpose located on the transformer or power supply as indicated in 600.32(H). Figure 5. A basic schematic of a midpoint referenced wiring scheme. 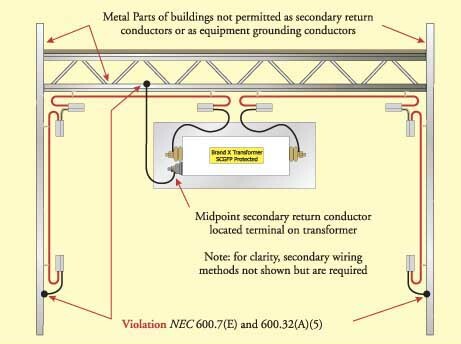 The Code also includes mandatory rules that prohibit any metallic building parts from being used as secondary return conductors or equipment grounding conductors (see figure 6). This is the Code’s way of saying keep current on the path it was intended to flow on. 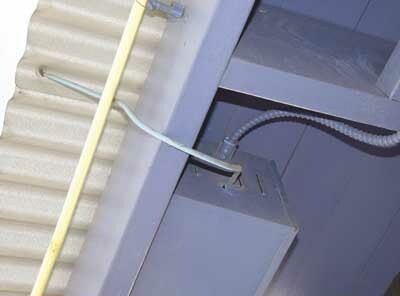 Using metal building parts as a return conductor for a neon secondary circuit is not only a violation of the Code, it is a real safety concern for persons and property (see figure 6). This requirement is found in two sections of Article 600. Section 600.7(E) under the grounding rules for signs and outline lighting systems prohibits this type of connection of these circuits; it is also addressed in 600.32(A)(5) under the neon secondary wiring method requirements. 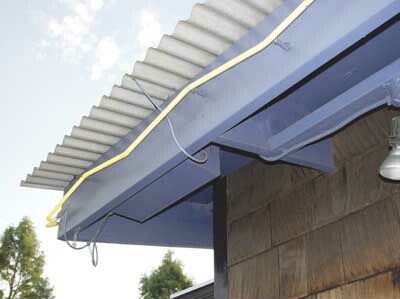 Using metal parts of a building as a high voltage return circuit is unsafe and can lead to shock hazards as well as arcing and tracking events that can manifest into a fire in no time. Photos 1 through 4 show violations where metal parts of a building are being used as secondary return conductors to the neon transformer. Neon signs and outline lighting systems are commonly employing the midpoint return wiring schemes. It is important for installers to understand the Code rules relative to the type of system design and wiring scheme chosen for the particular application in the field. It is also vital that electrical inspectors understand what to look for relative to the type of wiring scheme used for a sign or neon secondary circuit or system. A couple of key points to remember are that the transformer must (1) be listed for the intended purpose or application, and (2) be installed in accordance with the installation instructions. The Code generally requires these transformers or power supplies to include secondary circuit ground-fault protection (SCGFP) as indicated in 600.23(A) and (B). The transformer is required to be marked to indicate it is equipped with SCGFP [see 600.23(F)]. 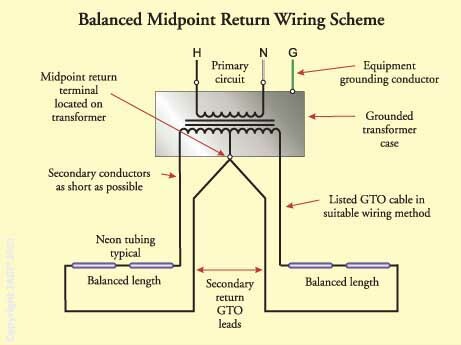 The midpoint return wiring scheme should include four GTO conductors terminating at the transformer, two from the output hubs and two connected to the midpoint return terminal or lead on the transformer for this purpose [see 600.32(H)]. The secondary conductors should not exceed the maximum lengths specified in 600.32(J), based on the type of wiring method used. All other intermediate secondary jumpers and circuit conductors between tubing sections are required to be kept as short as practicable as required by 600.32(J)(2). This article is the second in a series of articles that will provide some valuable information on electric signs and neon lighting. Understanding neon secondary wiring and circuitry is important for installing safe neon systems, and and is also important for proper conformance assessment (inspections) of these installations. Inspections are required for conformance assessment of electrical installations and without an inspection, there generally is no approval. IAEI’s book, Neon Lighting, is a valuable resource for the installer as well as the inspector, and it provides many details about all aspects and concerns of these types of installations. This article provides another small segment of the information contained within Neon Lighting. Electrical safety is important, and consistency and uniform application of electrical Code rules to signs and outline lighting systems are two of the goals and primary objectives of the IAEI. The IAEI supports effective communication between the sign industry and the inspection community in the interest of safety. The new Neon Lighting is certain to promote those goals and objectives. If in doubt about how these systems work or how the Code should be applied, it never hurts to ask. As always, consult the local authority having jurisdiction for approvals or for any local regulations that may also apply in your area.